SPECIAL DEAL - Usually 149.99, today just 49.99 - Save £100! 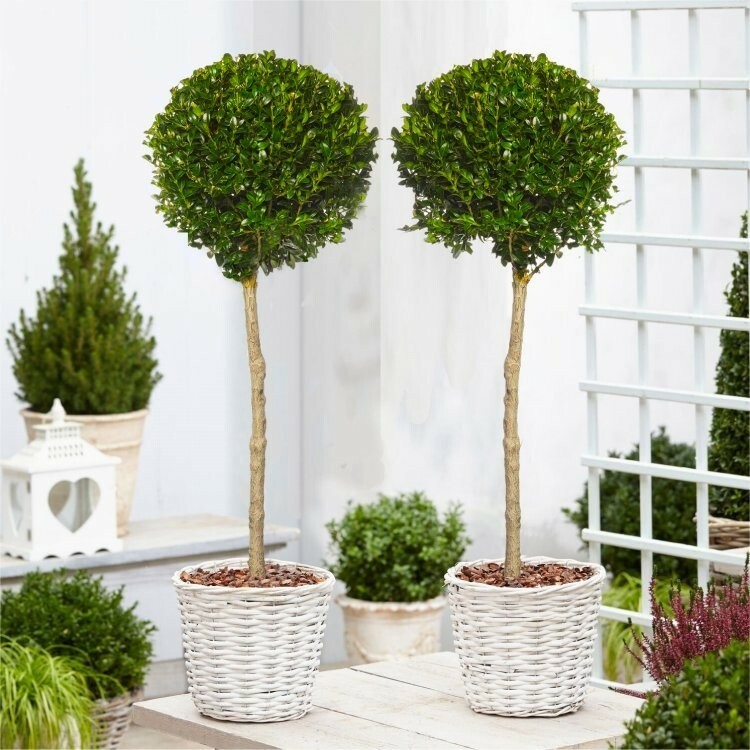 A pair of these tightly rounded evergreen box spheres, on top of long clear stems, are excellent for flanking a set of steps, doorway or path. Alternatively use them singly to create stylish focal points on the patio and around the garden. Topiary Standards crafted from the classic evergreen topiary buxus are often hard to find, and very expensive given the length of time required to create them. These are one of our recommended plants, they're perfect for positioning in swanky planters in a partially shady site, where the glossy, green leaves provide all year foliage interest and structure. Dense plants with small, round green leaves are easy to grow in most soils, simply keep well fed and watered to maintain the best foliage colour. Supplied as strong specimen plants clipped into neat spheres with an approx diametre of up to 40cms+ atop a clear stem of around 60cms in approx 10 litre containers, the overall height is around 100-110cms. Plants can easily be kept tidy and shaped by clipping a couple of times each year. Evergreen box plants are ideal for a formal garden or courtyard, or as a style statement on terraces, balconies and patios.